I will say this about The Thing The Book: it is very bookish. That is, postdigitally bookish. I spent a week with Jonn Herschend & Will Rogan’s collection The Thing The Book (TTTB). I carried it in my backpack. I recognized its smell every time I opened it. I didn’t like the smell. I read the essays in it. I stared for hours at the wonderful plates and illustrations. I toyed with the inner flipbooks. I laughed at all the meta games. I examined every little detail as I felt compelled by the book. Adjacently (? 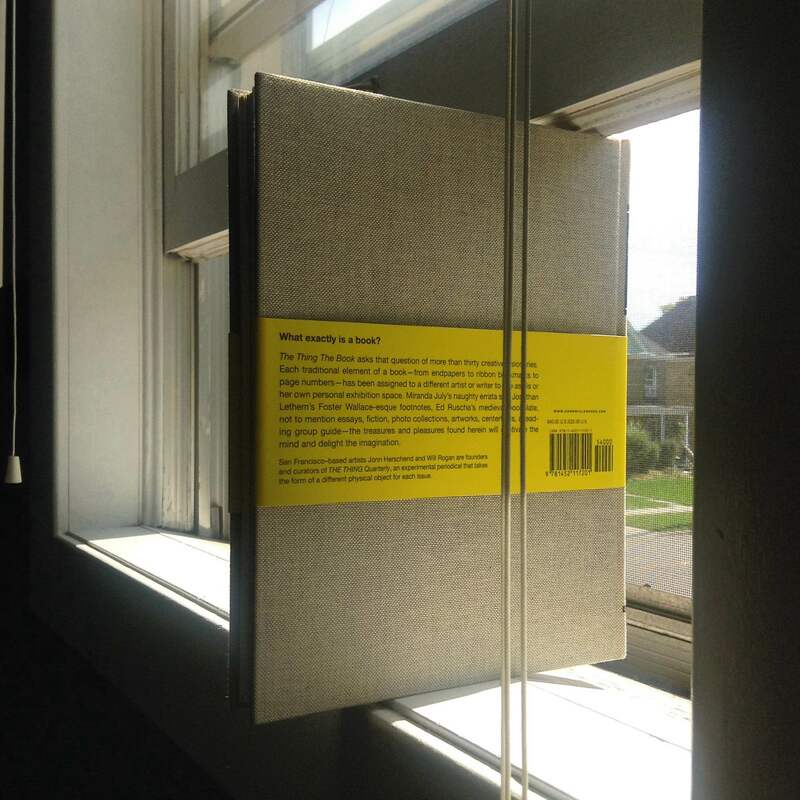 ), I used it as a coaster, to write down a phone number, to hold my window open, to flatten a red maple leaf, to lift my laptop by an extra two centimeters during a skype meeting, and to carry documents I didn’t want to get wrinkled. The Thing The Book holding my window open. I loved carrying TTTB around in a way that reminded me how I loved carrying books in the 90’s—that is, before I had a cellphone or a laptop—that is, with a solid awareness of its presence, of the book as company. When I closed TTTB this morning, having examined—I think—everything I could, I was left asking myself what else can I do with it? A feeling akin to letting go of a favorite story after reaching the last page. It would seem that TTTB has managed to touch on every possible element of what a print book is (has been) or what a print book can do or be used for. But I wonder if that feeling of incompleteness I got when I was done with it, a reluctance towards the book’s finitude point towards the opposite. I could easily blame this feeling on the (let’s call it) “digital” expectation that “devices” get updated, that functionalities are enhanced/improved/diversified by new apps and so forth. It is also true that the digital has filtered through our reading and writing practices—even of the most bookish books. But, on some level, it seems to me that the array of TTTB’s material/cognitive qualities—pretty much unthinkable for any “regular” book—is actually (maybe unwillingly) remediating the multifunctionality of tablets and smartphones into print. By highlighting an enormous catalogue of print books’ material affordances that remembers the all-in-one-ness rhetoric of digital devices—complemented with a clear nostalgic take on the current place of books regarding e-books and other digital reading interfaces—TTTB showcases the extent to which it is a product of a postdigital consciousness. In its extreme bookishness lies the digital dimension of TTTB.